Joe Nemechek picked up the 1st last-place finish of his NASCAR Camping World Truck Series career in Saturday’s LTi Printing 200 at the Michigan International Speedway when his #87 D.A.B. Constructors Chevrolet fell out with a vibration after he completed 2 of 100 laps. The finish came in Nemechek’s 30th series start. In addition to his 667 Cup Series starts and 427 in XFINITY, Joe Nemechek has dabbled in the Truck Series since 1996. He made his series debut at Watkins Glen in 1996, where he won the pole and finished runner-up to Ron Hornaday, Jr. Aside from three starts for team owner David Dollar in 2006, Joe has always competed in his own equipment under the NEMCO Motorsports flag. In 2013, Joe began to turn his attention from his struggling Cup operation to the Truck Series, where his son John Hunter made his own series debut on October 26 at Martinsville. In 2014, both Joe and John Hunter campaigned the #8 truck in honor of Joe’s brother John, who lost his life in a crash at Homestead in 1997. Named for his late uncle, John Hunter broke through with his first of five Truck Series wins at Chicagoland in 2015. After sharing the #8 ride for two seasons, Joe stepped aside last year, and John Hunter immediately made a bid for the Truck Series title before an engine failure at Talladega knocked him out of contention. 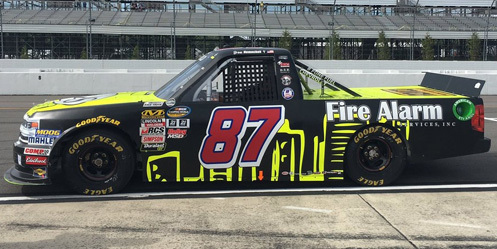 This year, Joe has returned to the Truck Series for the first time since 2015, and is again driving NEMCO’s iconic #87 which he’d made a fixture in all three of NASCAR’s top divisions. He began the year competing in the opening three races at Daytona, Atlanta, and Martinsville. He ran 5th at Daytona - Joe’s first Top 5 in the series since 2014 – and followed 4th-place John Hunter to the checkered flag. NEMCO’s #87 didn’t return until June, when a series of short fields encouraged other fellow owner-drivers such as Norm Benning and Jennifer Jo Cobb to enter second trucks. Here, Joe’s role changed once more as he “start-and-parked” at Gateway, Iowa, and Pocono, then missed the field at Kentucky. Joe Nemechek is no stranger to the “start-and-park” strategy. In the early 2000s, Joe and teammate Jeff Fuller parked the team’s backup cars in the XFINITY Series, and Fuller stormed to three consecutive LASTCAR XFINITY Series titles in 2003, 2004, and 2005. The 2008 economic collapse inspired Joe to bring NEMCO back to the Cup Series for the first time in more than a decade, and as he rebuilt the program by parking in several races, took his second LASTCAR Cup title in 2010. Joe’s 33rd Cup last-place finish, which came at Martinsville in 2014, broke the career record of the late J.D. McDuffie, whose 32nd finish came in his tragic final race at Watkins Glen. Combined with another six in XFINITY, Joe came into 2017 with 39 NASCAR last-place finishes, the 2nd-most all-time. But, even as he parked his truck this summer, he’d yet to finish last in it. With only 30 trucks on the entry list for Saturday’s 32-truck field at Michigan, Joe returned once more to help fill the field. Joe didn’t participate in Friday’s opening practice, then turned in a single lap in Happy Hour. His #87 was slowest overall, putting up a lap of 166.902mph, nearly five seconds slower than his son’s lap of 186.795mph. Joe picked up speed in qualifying, shaving nearly two seconds off his practice lap with a speed of 174.787mph, good enough for 23rd on the grid. John Hunter placed 3rd on the grid with a lap of 183.791, trailing only the front row of Matt Crafton and Johnny Sauter. Starting 30th and last was Pocono last-placer Mike Senica, who was again driving for Norm Benning. Bell Plantation, Senica’s sponsor for many of his short-track rides, added its name to the quarter-panels of his black #57 Chevrolet. Senica was over 25mph slower than Matt Crafton’s fastest lap in opening practice, then turned in the slowest qualifying lap of 157.604mph, more than six seconds off the pole. On race day, he was joined in the back by Jordan Anderson, whose #1 Kool Chevrolet-Buick-GMC / Sturgis Bank Chevrolet was sent to the rear for unapproved adjustments. On the first lap, 25th-place starter Todd Peck, who swapped rides with Camden Murphy to drive D.J. Copp’s #83 Pulse Transport / National Arthritis Foundation Chevrolet, pulled down pit road. Similar to Matt DiBenedetto in last month’s Cup race at Pocono, Peck crossed the start/finish line as he pulled into the garage area, crediting him with one lap complete. On Lap 3, Joe Nemechek, now 20 seconds behind the leader, pulled into the garage as well, crediting him with two laps complete. This ranked Joe one lap and one position ahead of Peck in 29th. Peck then rejoined the race on Lap 4, three laps down to the leaders. When the leaders poured into Turns 1 and 2, John Hunter Nemechek was locked in a tight race for 2nd. Running on the inside of Chase Briscoe’s #29 Cooper Standard Ford, Briscoe turned left past the apex in an attempt to side-draft the #8. The move caused John Hunter to lose control, slide up the track, and back hard into the outside wall. John Hunter managed to drive his truck back to pit road, then pulled into the garage. Like Peck, John Hunter crossed the start/finish line as he exited, crediting him with four laps complete. Peck remained on the track until Lap 8, still under John Hunter’s caution, before parking his #83 for good. Since he was three laps down, this gave Peck 5 laps complete to the Nemecheks’ 4 and 2, placing father and son in the final two spots. Mike Senica fell out next, finishing 27th, with Ray Ciccarelli, back for the first time since Eldora, rounding out the Bottom five for Jennifer Jo Cobb Racing in the #0 Driven2Honor.org Chevrolet. Taking the checkered flag on Saturday was Darrell Wallace, Jr., his first win in the series since 2014, and incredibly, in his first start since that same year. Wallace was the latest driver to run for MDM Motorsports, and the first to win for them in the Truck Series. Matthew Miller’s team is relatively new in NASCAR, having branched out from the K&N Pro Series East into both ARCA and the Truck Series. The team finished last this year at Daytona with Tommy Joe Martins. *Nemechek’s last-place finish was just the fourth for truck #87 in Truck Series history, and the first for the number in the series since August 20, 2011, when Chris Jones’ #87 Garbee’s Truck & Trailer Chevrolet lost the engine on the opening lap of the VFW 200, also held at Michigan. Joe Nemechek’s finish at Michigan made significant LASTCAR history. Joe and John Hunter became the first father-son pair in NASCAR’s top three divisions to finish in the final two positions of a NASCAR points-paying race. This includes some of the sport’s most famous families and longest-active veterans, including the Pettys, Allisons, Earnhardts, Bakers, Marlins, and Sauters. (CORRECTION (August 15): This is actually the second time in NASCAR history, the first since March 27, 1988, when Richard and Kyle Petty finished at the tail end of the TranSouth 500 at Darlington. As of this writing, it's the first time it's happened in Truck Series history. With this, his first last-place run in the Truck Series, Joe also joined a select list of drivers – including Mark Martin, Aric Almirola, and J.J. Yeley – who have finished last at least once in each of NASCAR’s top three series. Most significantly, this marked Joe’s 40th last-place finish across NASCAR’s top three series, breaking a tie with Morgan Shepherd for the 2nd-most last-place finishes in NASCAR history. 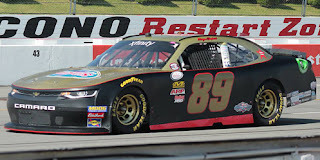 Morgan Shepherd picked up the 17th last-place finish of his NASCAR XFINITY Series career in Saturday’s Mid-Ohio Challenge at the Mid-Ohio Sports Car Course when his #89 Racing With Jesus Chevrolet fell out with handling issues after he completed 5 of 75 laps. The finish, which came in Shepherd’s 413th series start, was his second of the season, his first since suspension issues after 19 laps at Michigan, eight races ago. As Shepherd continues to celebrate his 50th year in racing, he has also begun to make more races than he has missed. After missing the cut in four of his first seven attempts, the 75-year-old driver came to Mid-Ohio having made seven of the previous ten (and two of the three missed races having been withdrawals at Daytona and Watkins Glen). Still, Shepherd’s best finish of the season remained only a 35th at Talladega, and he’d come within striking distance of finishing last at both Bristol, Iowa, and Indianapolis. Shepherd is another driver to have finished last at least once in all three of NASCAR’s top divisions. He’s also the only driver to score a LASTCAR Championship in both the Cup and XFINITY Series, claiming the former in 1983 and the latter in 2007. 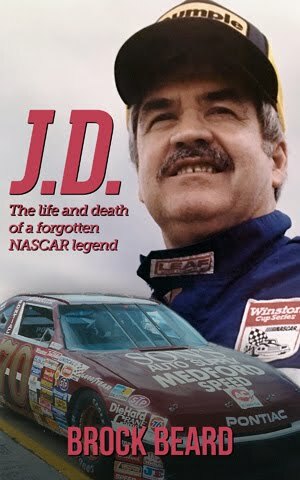 In all, Shepherd came into 2017 with 18 last-place runs in Cup, 15 in XFINITY, and 5 in Trucks for a combined total of 38, good enough for 3rd in the all-time LASTCAR rankings. He then finished last once more in the XFINITY race at Michigan in June, tying him with Joe Nemechek for 2nd in those rankings with 39 apiece. 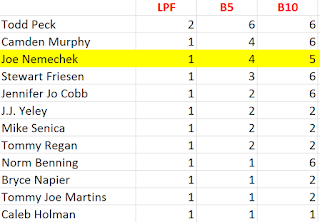 And now, on the morning of the Mid-Ohio race, Nemechek had once again pulled ahead, taking sole possession of 2nd with his 40th career run. Shepherd didn’t complete a lap in Saturday morning’s rain-postponed practice session, though he was listed along with Stephen Young’s #78 for owner B.J. McLeod and owner-driver Jeremy Clements in the #51 as three drivers who likely aborted their one attempted lap. His first completed lap came in qualifying, where he ran the slowest time of 85.591mph, 11 seconds slower than Sam Hornish, Jr.’s pole lap. With exactly 40 drivers arrived to attempt the 40-car field, this put Shepherd 38th on the grid. Starting last was Cody Ware, who along with 39th-place starter Joey Gase did not complete a qualifying lap. For the second-straight race, Ware drove for Veterans Motorsports, Inc. in Mike Harmon’s #74 Dodge. He was involved in a pair of incidents earlier that day, first by spinning Stephen Young, and then losing his own engine. Both he and 39th-place starter Joey Gase didn’t put in a time during qualifying. At race time, Ware only held the last spot briefly. Seven drivers fell to the rear of the field before the starts, including 31st-place starter Jeff Green, who elected to pull his #93 RSS Racing Chevrolet out of line. Already, Green looked poised to score his third-straight last-place finish at Mid-Ohio, and he would attempt it in the same all-black Chevrolet he raced at The Glen. Two of the seven drivers sent to the rear started backup cars: Enrique Baca in the #13 Peak Coolant & Motor Oil Toyota and Cole Custer in the #00 Haas Automation Ford. In qualifying, Custer’s Ford ran off-course twice, the second causing the splitter to dig into the wet grass, tearing off much of the right-front bodywork. Though he’d managed the 9th-fastest time in qualifying, the pre-race penalty meant he’d line up 38th. When the race started, Custer’s car immediately began smoking, and he was black-flagged to come down pit road. Two more drivers also had issues on that first lap: Sheldon Creed, who cited transmission trouble on JD Motorsports’ #01 United Rentals Chevrolet, and Shepherd. Shepherd, who started alongside Jeff Green at the tail end of the field when Custer passed them at the start, dropped behind Green after the first couple of corners, and was two seconds behind Green by Turn 4. An undisclosed mechanical issue caused Shepherd to follow both Custer and Creed onto pit road, and thus Shepherd was ranked 40th, Custer 39th, and Creed 38th. Shepherd must also have used a garage entrance before the start / finish line, much as Trevor Bayne did in last Sunday’s Cup race at Watkins Glen, as he was not credited with completing any laps while Custer and Creed were listed one lap ahead. Since Shepherd has only completed a handful of laps in each of his starts this year, it appeared the #89 was already done for the day. 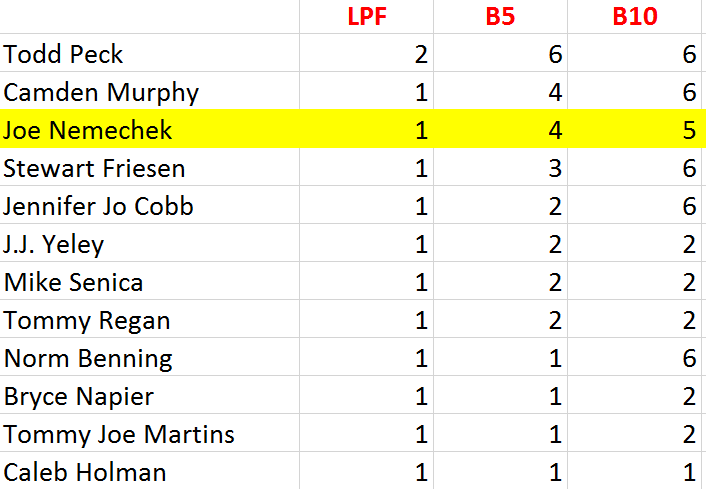 If this were the case, Shepherd would rejoin Nemechek in a tie for the 2nd-most last-place finishes in NASCAR history just hours after Nemechek trailed in Michigan. However, on Lap 7, Shepherd rejoined the race and, as he came down pit road, was finally credited with his first lap. The next time by on Lap 8, Shepherd had passed both Custer and Creed, dropping Custer to last. On Lap 9, Jeff Green made his own bid for the spot when he pulled his #93 off the track, and became the race’s first retiree. Shepherd struggled on until Lap 12, then retired with handling woes after completing five laps. This kept Shepherd in 38th, behind Green, but ahead of both Creed and Custer. Both the #00 and #01 were repaired, and on the 18th circuit, Creed rejoined the race, followed by Custer on Lap 23. First Creed, then Custer passed Shepherd, who took last for the final time on Lap 28. Green was shuffled to 39th four circuits later. Creed and Custer finished 34th and 35th, respectively. Finishing 38th was Matt Bell, who experienced the day’s most frightening crash when Mario Gosselin’s #90 ActevMotors.com Chevrolet, ran off-course in Turn 1 and slammed head-on into a tire barrier, upending the car on the concrete barrier behind. Bell, making his first XFINITY start since 2012, walked away uninjured. The rest of the Bottom Five was filled by an accident on Lap 53, when 37th-place Jeremy Clements in the #51 BRT Extrusions Chevrolet and 36th-place Spencer Gallagher in the #23 Allegiant Airlines Chevrolet ran nose-to-tail into Ryan Reed, who himself could not avoid the spinning Blake Koch. Reed was later eliminated in another hard crash with Justin Marks, leaving Reed 33rd. *Shepherd’s last-place finish was the first for car #89 – and for Chevrolet – in an XFINITY Series race at Mid-Ohio. It also marked the first time an XFINITY Series last-place finisher was listed out due to “handling” issues since March 16, 2013, when Michael McDowell’s #27 Team Boom Toyota fell out after 2 laps of the Jeff Foxworthy’s Grit Chips 300 at Bristol. 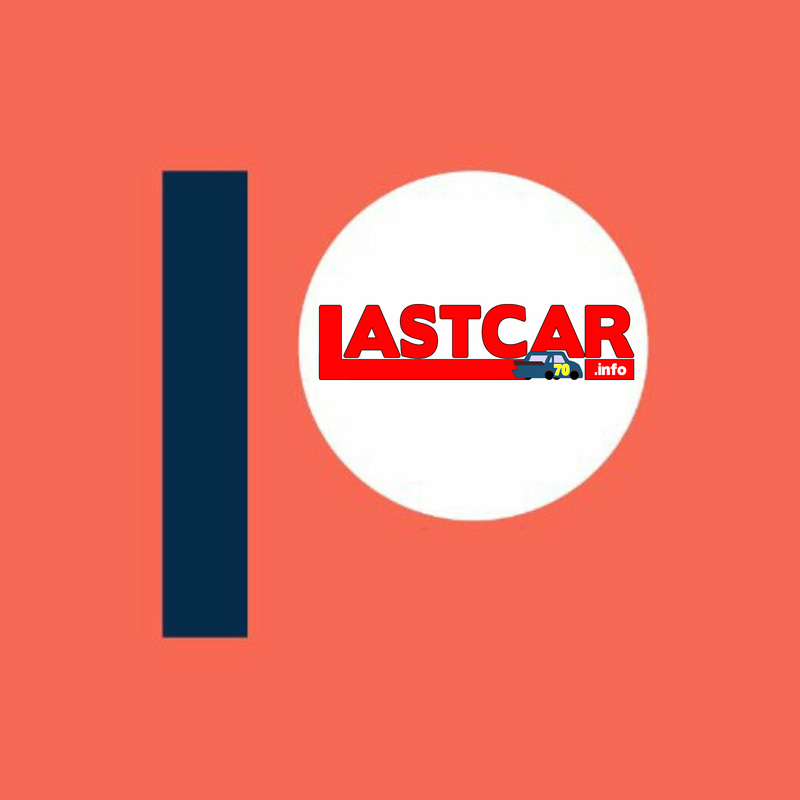 In all, the runner-up spot in LASTCAR’s all-time rankings changed hands four times on Saturday before it ultimately resulted in the same tie. 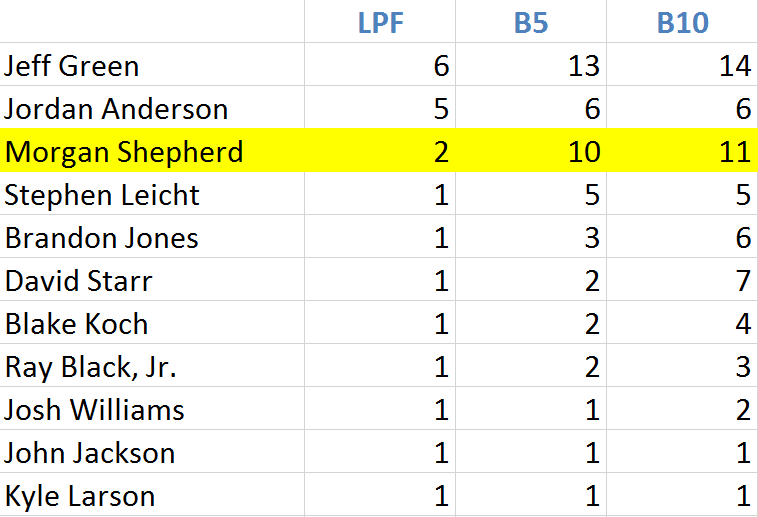 Both Shepherd and Nemechek now stand at 40 last-place finishes each, a full 60 finishes behind all-time leader Jeff Green’s current mark of 100. 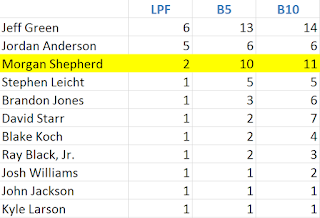 Shepherd also broke a tie with Matt DiBenedetto for the 3rd-most last-place finishes in XFINITY Series history, and now trails only Green and Jeff Fuller. 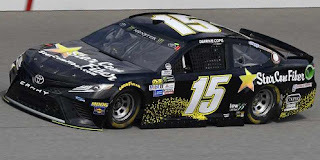 Derrike Cope picked up the 27th last-place finish of his Monster Energy NASCAR Cup Series career in Sunday’s Pure Michigan 400 at the Michigan International Speedway when his #15 StarCom Fiber Toyota lost the engine after 107 of 202 laps. The finish, which came in Cope’s 420th series start, was his first in a Cup race since October 8, 2006, when overheating issues stopped his drive in Raynard McGlynn’s #74 Royal Administration / Sundance Vacation Dodge after 9 laps of the UAW-Ford 500 at Talladega, 389 races ago – a race best known for Brian Vickers’ controversial first Cup victory after a last-lap wreck involving Dale Earnhardt, Jr. and Jimmie Johnson. From October 8, 2006 until just this year, Cope would attempt another 26 Cup Series points races through 2011 and make just one – a next-to-last-place effort at Martinsville for Larry Gunselman on October 25, 2009. Outside of occasional attempts to make both the Daytona 500 and the All-Star Race, Cope turned his focus to the NASCAR XFINITY Series, where he started his own team. The latest incarnation of his program came in 2014, when he bought Mary Louise Miller’s ML Motorsports program and campaigned the #70 Chevrolet for three years. Late last year, following a 38th-place finish at Kansas in October, Cope suspended operations once more. On top of his 1990 Daytona 500 victory, one of two in the Cup Series, and an XFINITY checkered flag at Loudon in 1994, Cope has also carved out his own share of LASTCAR history. 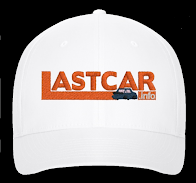 As the 1996, 2003, and 2006 LASTCAR Cup Series Champion, Cope also claims the same mark as Joe Nemechek (after Saturday) and Morgan Shepherd as a driver with at least one last-place finish in all three of NASCAR’s top divisions. 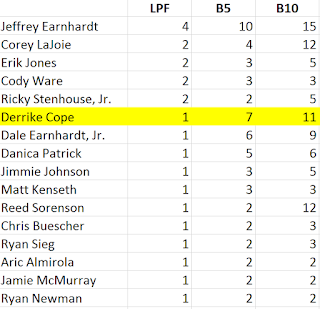 Cope ended the 2016 season with 26 Cup Series last-place finishes, 9 in XFINITY, and one in Trucks for a career total of 36 – 3rd most in NASCAR history, and three finishes behind both Nemechek and Shepherd. 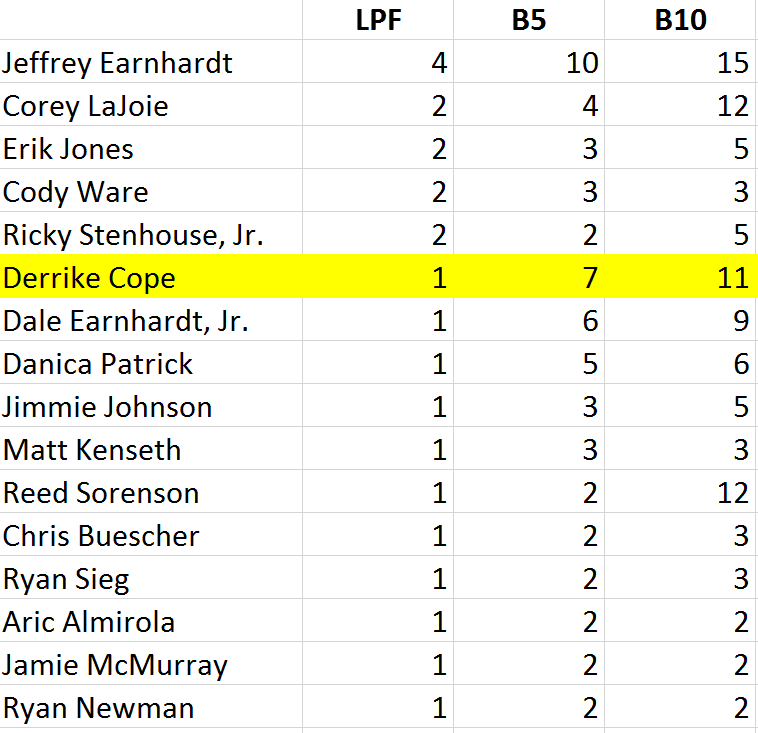 Most significantly, Cope’s lone Truck Series finish, which came May 16, 2008 at Charlotte, was Cope’s 33rd last-place run across NASCAR’s top three series, breaking a tie with the late J.D. McDuffie for the all-time last-place record. Cope held the all-time mark until June 23, 2012, when current record holder Jeff Green passed him at Road America. On February 8, 2017, it was announced that Cope would be returning to the Cup Series part-time this year with Premium Motorsports, the number of races determined by sponsorship. At Atlanta on March 5, Cope, now 58, made his first start in a Cup points race in more than a decade, finishing 36th. Heading into Michigan, Cope had started 11 of the previous 22 races with a season-best 31st at both Bristol and Charlotte, and in between worked with the crew in the garage. The car has carried a number of sponsors, including Sundance Vacations, which backed his 2006 ride with McGlynn Motorsports. Through it all, Cope had yet to finish last in 2017, thanks in part to the determination of his crew. He held last for much of the race at Fontana, but returned to the track and passed Jeffrey Earnhardt for 38th. The team had done the same for Gray Gaulding in his team debut at Kentucky, this time at the expense of Jimmie Johnson. At Michigan, Cope would drive Premium’s Chartered car, the #15, with returning Pocono sponsor StarCom Fiber. Cope’s teammate, Reed Sorenson, would drive the #55 with sponsorship from fellow Premium backer Low T Center. Cope ran 38th of the 39 entered drivers in Friday’s opening practice, qualified 37th with a lap of 188.132mph, then on Saturday ran 38th in the morning session before skipping qualifying. Starting last in Sunday’s race was B.J. McLeod, the same driver who trailed Cope in each of the first two practices. As McLeod’s team repaired its two battered XFINITY Series cars for “road ringers” Stephen Young (finished 24th) and Josh Bilicki (29th) after a physical race at Mid-Ohio, McLeod himself would drive the #51 Corrigan Oil Chevrolet for Rick Ware Racing. It was the first Cup start for driver and team since Indianapolis, where they came home 32nd. Joining McLeod at the rear were Matt DiBenedetto, whose Go FAS Racing Team failed pre-qualifying inspection four times on Friday, and Hendrick Motorsports teammates Jimmie Johnson and Kasey Kahne, both sent to backup cars after each found the Turn 1 wall in Happy Hour. “There’s a one-million-dollar bonus if you keep that 5 and 48 behind you for one lap,” the crew joked with McLeod before the start. “We’re gonna lose that one,” said the driver. “I’m gonna let them go by.” True to his word, both Johnson and Kahne zipped past McLeod at the start, and the #51 Chevrolet quickly lost ground to the leaders. On Lap 6, when McLeod was more than 10 seconds behind the leader, he was closing in on both Premium Motorsports cars. “Faster than Cope,” said the spotter, “catching up to Sorenson.” The next time by, McLeod was within two-tenths of a second of catching Cope, only to lose ground over the next five circuits. On Lap 16, McLeod was the first to be lapped by the then-dominant Brad Keselowski. He lost another on Lap 31. Matt DiBenedetto showed speed in his #32 Can-Am / Kappa Ford. However, a fueling issue put the team off sequence, costing them laps to the leaders. 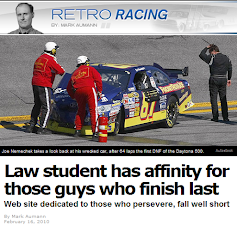 On the 33rd circuit, this misfortune briefly put DiBenedetto in last until McLeod retook it on Lap 35. Next to bid for the last spot was Reed Sorenson, three laps behind on the 43rd circuit. He only held it for a lap, as on Lap 44, McLeod pulled his car onto pit road, where the crew raised the hood. He then went behind the wall, citing a crack in the exhaust. Back in the paddock, the Rick Ware Racing crew once again set to work on making in-race repairs, which were completed by Lap 62. That time by, during the caution that ended Stage 1, McLeod drove out of the garage and onto pit road, rejoining the field 20 laps behind. Other than being in McLeod’s sights during the opening laps, Cope didn’t enter the last-place picture until Lap 117. Nine laps down at the time, Cope’s car began trailing smoke down the backstretch, and the car pulled low on the backstretch as it slowed. Thanks to directions from the crew, Cope managed to pull off the track through the rear entrance to the paddock, thus avoiding a caution short of the finish to Stage 2. “I should’ve just stopped and let them push it in,” said Cope as he waited for a tow. It wasn’t until Lap 123 that the #15 finally made it into the garage area itself, and not until Lap 131 that Cope took last from McLeod. Done for the day with engine troubles, Cope’s bid for last was the final one of the day. McLeod finished 36th, the final car running under power. In between McLeod and Cope were Kasey Kahne and Daniel Suarez, who tangled off Turn 2 on Lap 140, triggering a hard two-car accident. Suarez, who scored his first stage win last week at Watkins Glen, led for 3 laps and seemed to have one of the fastest cars before the accident ruined his day. Rounding out the Bottom Five in 35th was Jeffrey Earnhardt, back behind the wheel of Circle Sport with The Motorsport Group’s #33 Hulu Chevrolet. *This marks Cope’s fifth last-place finish in a Cup race at Michigan, the most of any driver in series history. The previous four occurred June 23, 1991 (#10 Purolator Chevrolet lost an engine after 2 laps), June 23, 1996 (#12 Badcock Ford burned a piston after 53 laps), August 16, 1998, (#30 Gumout Pontiac crashed after 7 laps), and June 18, 2006 (#74 Howes Lubricator / Royal Administration Dodge overheated after 12 laps). All of his Michigan last-place finishes each came for different teams (Whitcomb Racing, Bobby Allison Motorsports, Bahari’ Racing, McGlynn Motorsports, and Premium Motorsports). *This marked the second-consecutive last-place finish for car #15 in the August Cup race at Michigan. Last year, Clint Bowyer’s 5-hour Energy Chevrolet for HScott Motorsports finished 40 laps down, but under power, after mechanical issues. One day after losing a last-place finish to both Joe Nemechek and Morgan Shepherd, Cope’s engine failure kept him within the same three-finish gap behind both drivers. He also closes within one finish of tying Michael McDowell for 3rd in the LASTCAR Cup Series rankings. McDowell, who ran 27th on Sunday, has improved by leaps and bounds along with the Leavine Family Racing team. After claiming three consecutive LASTCAR Cup Series titles as a “start-and-park” driver in 2011, 2012, and 2013, McDowell’s lone DNF of the season came after 168 of 188 laps at Talladega. His 99.1% of laps completed remains a series record for the season. Now I know why this was one great big long article. A major 2nd all time last-place battle.